You can transfer an image to the projector and then display it whenever the projector turns on. You can also display the image when the projector is not receiving an input signal or when you temporarily stop projection. This transferred image is called the User's Logo screen. The image you select as the User's Logo can be a photo, graphic, or company logo, which is useful in identifying the projector's owner to help deter theft. You can prevent changes to the User's Logo by setting up password protection for it. Note: When you copy the menu settings from one projector to another using the batch setup feature, the user logo is also copied. Do not include any information in the user logo that you do not want to share between multiple projectors. Display the image you want to project as the User's Logo. Press the Menu button, select the Extended menu, and press Enter ( ). Select the User's Logo setting and press Enter ( ). You see a prompt asking if you want to use the displayed image as a user's logo. Select Yes and press Enter ( ). You see a selection box overlaying your image. Note: When you select User's Logo, adjustments such as Keystone or Aspect are temporarily canceled. Use the arrow buttons on the remote control to surround the image area you want to use as the User's Logo and press Enter ( ). You see a prompt asking if you want to select this image area. Select Yes and press Enter ( ). (If you want to change the selected area, select No, press Enter ( ), and repeat the last step.) 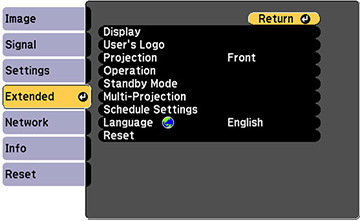 You see the User's Logo zoom factor menu. Select a zoom percentage and press Enter ( ). You see a prompt asking if you want to save the image as the User's Logo. Select Yes and press Enter ( ). You see a completion message. Press Esc to exit the message screen. Select Display and press Enter ( ). To display it whenever there is no input signal, select Display Background and set it to Logo. To display it whenever you turn the projector on, select Startup Screen and set it to On. To display it whenever you press the A/V Mute button, select A/V Mute and set it to Logo. To prevent anyone from changing the User's Logo settings without first entering a password, set a password and enable User's Logo security.